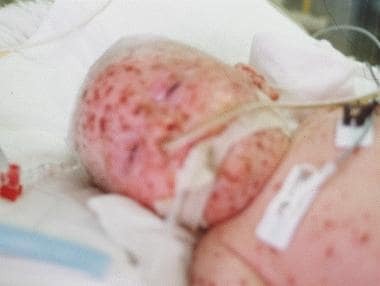 Omenn syndrome (MIM 603554) is an autosomal recessive form of severe combined immunodeficiency (SCID) characterized by erythroderma, desquamation, alopecia, chronic diarrhea, failure to thrive, lymphadenopathy, and hepatosplenomegaly (see the image below). A unique dermatitis characterizes Omenn syndrome. The dermatitis initially resembles eczema, but with a pachydermia, as observed here. The lesions progress to desquamation. Failure to thrive is evident. This infant weighed 6 pounds at age 6 months; his weight had not changed since birth. Cutaneous manifestations are common in primary immunodeficiency disorders. Erythroderma of infancy with diffuse alopecia is closely linked with children having SCID. These patients may also develop fungal, bacterial, and viral infections typical of SCID. In this syndrome, the SCID is associated with the virtual absence of B cells and the presence of oligoclonal autoreactive T cells. Lymphocytosis results from the expansion of an oligoclonal population of activated and antigen-stimulated T helper 2 (TH 2) cells that produce elevated levels of interleukin 4 (IL-4) and interleukin 5 (IL-5). The latter cytokines mediate eosinophilia and elevated immunoglobulin E (IgE) levels (see the image below). Common viral infections are fatal in severe combined immunodeficiency (SCID). This female infant died before bone marrow stem cell engraftment could occur, when varicella became resistant to acyclovir. The nasal bridge reveals superinfection with Klebsiella pneumoniae. Lymphedema, a characteristic of Omenn syndrome, is also shown. Impaired V(D)J recombination process leads to the generation of a few T cells expanding in the periphery, infiltrating target organs such as skin and gut, resulting in the erythroderma and colitis typical of this syndrome. Thus, the inability to productively rearrange VDJ regions in T-cell and B-cell receptors leads to abnormal T cells and absent B cells. Early recognition of this condition is important for genetic counseling and early treatment. The inflammation may be triggered by clonally expanded T cells, predominantly of the Th2 type. These abnormal T cells presumably secrete cytokines that promote autoimmune as well as allergic inflammation. Omenn syndrome has been identified in leaky SCIDs caused by hypomorphic mutations in recombinase genes RAG-1 and RAG-2, which impair but do not eliminate recombination of variable, diversity, and joining (VDJ) segments of TCR and Ig genes. Most cases of Omenn syndrome reported so far are associated with hypomorphic mutations in RAG-1/RAG-2 genes. However, Omenn syndrome is now known to occur in other leaky SCIDs with mutations in the RNA component of mitochondrial RNA processing endoribonuclease, adenosine deaminase, interleukin 2 (IL-2) receptor gamma, interleukin 7 (IL-7) receptor alpha, the nuclease ARTEMIS, and DNA ligase 4. Thus, Omenn syndrome is a distinct inflammatory process that can be associated with genetically diverse, leaky SCIDS. Accordingly, Omenn syndrome is best viewed, not as a specific form of SCID, but rather as an aberrant inflammatory condition that can be associated with multiple genetic abnormalities, which can significantly impair (but not abolish) T-cell development in the thymus. A novel homozygous frameshift mutation in IL7R (c.562delC) was indentified in the proband with both parents being Taiwanese aborigines who were delineated as carriers, none of whom had Omenn syndrome. Mutations in the DCLRE1C gene, which encodes ARTEMIS, have been described in a number of patients. [10, 11] Many of the mutations were gross deletions of exons 1-3 or exons 1-4. An oligoclonal expansion of Th2 population is viewed as a result of increased exposure to inadequately cleared antigens. These oligoclonal T cells have a highly restricted receptor repertoire, as well as increased apoptosis due to overexpression of CD95 and underexpression of anti-apoptotic factors, such as bcl -2. Germinal centers are absent in the lymph nodes, which is consistent with the inability to produce functional antibodies. Hassall corpuscles are poorly formed, and lymphocytes are deficient in the thymus. Paracortical lymphocytes are absent in the spleen. The frequency of Omenn syndrome is difficult to ascertain. The prevalence of all forms of SCID is estimated to be 1 case per 50,000 population. Omenn syndrome has been reported in patients from throughout the world, mainly North America and Europe. Omenn syndrome is fatal if untreated. Patients have life-threatening viral, bacterial, fungal, and Pneumocystis carinii infections that are observed in other types of SCID. Patients commonly have Staphylococcus aureus sepsis, which is related to the generalized dermatitis. Live viral infections, including those due to attenuated oral poliovirus, may cause death. In addition, chronic diarrhea and resulting inanition may be responsible for death. Bone marrow transplantation (BMT) is usually successful, but life-threatening acute or chronic graft versus host disease (GVHD) may be a complication. This can occur in any stem cell reconstitution procedure. Patients have been identified in the United States, Canada, Europe, and India. The incidences are equal among male and female infants; this observation is consistent with the autosomal recessive etiology of Omenn syndrome. Infants present within weeks of birth and usually by age 3 months, as do those with other types of SCID. The characteristic dermatitis, chronic diarrhea, and failure to thrive often precede the onset of infections. Published reports of patients describe presentation by the time the patient is aged 6 months. Al-Herz W, Nanda A. Skin manifestations in primary immunodeficient children. Pediatr Dermatol. 2011 Sep-Oct. 28(5):494-501. [Medline]. Couëdel C, Roman C, Jones A, Vezzoni P, Villa A, Cortes P. Analysis of mutations from SCID and Omenn syndrome patients reveals the central role of the Rag2 PHD domain in regulating V(D)J recombination. J Clin Invest. 2010 Apr. 120(4):1337-44. [Medline]. [Full Text]. Wang YQ, Cui YX, Feng J. [Clinical phenotype and gene diagnostic analysis of Omenn syndrome]. Zhonghua Er Ke Za Zhi. 2013 Jan. 51(1):64-8. [Medline]. Marrella V, Maina V, Villa A. Omenn syndrome does not live by V(D)J recombination alone. Curr Opin Allergy Clin Immunol. 2011 Dec. 11(6):525-31. [Medline]. Bai X, Liu J, Zhang Z, Liu C, Zhang Y, Tang W, et al. Clinical, immunologic, and genetic characteristics of RAG mutations in 15 Chinese patients with SCID and Omenn syndrome. Immunol Res. 2015 Oct 17. [Medline]. Jaouad IC, Ouldim K, Ali Ou Alla S, Kriouile Y, Villa A, Sefiani A. Omenn syndrome with mutation in RAG1 gene. Indian J Pediatr. 2008 Sep. 75(9):944-6. [Medline]. Villa A, Notarangelo LD, Roifman CM. Omenn syndrome: Inflammation in leaky severe combined immunodeficiency. J Allergy Clin Immunol. 2008 Dec. 122(6):1082-6. [Medline]. Wong SY, Lu CP, Roth DB. A RAG1 mutation found in Omenn syndrome causes coding flank hypersensitivity: a novel mechanism for antigen receptor repertoire restriction. J Immunol. 2008 Sep 15. 181(6):4124-30. [Medline]. Liao CY, Yu HW, Cheng CN, Chen JS, Lin CW, Chen PC, et al. A novel pathogenic mutation on Interleukin-7 receptor leading to severe combined immunodeficiency identified with newborn screening and whole exome sequencing. J Microbiol Immunol Infect. 2018 Mar 2. [Medline]. Pannicke U, Hönig M, Schulze I, Rohr J, Heinz GA, Braun S, et al. The most frequent DCLRE1C (ARTEMIS) mutations are based on homologous recombination events. Hum Mutat. 2010 Feb. 31(2):197-207. [Medline]. Mancebo E, Recio MJ, Martinez-Busto E, et al. Possible role of Artemis c.512C>G polymorphic variant in Omenn syndrome. DNA Repair (Amst). 2011 Jan 2. 10(1):3-4. [Medline]. Marrella V, Poliani PL, Casati A, et al. A hypomorphic R229Q Rag2 mouse mutant recapitulates human Omenn syndrome. J Clin Invest. 2007 May. 117(5):1260-9. [Medline]. Khiong K, Murakami M, Kitabayashi C, et al. Homeostatically proliferating CD4 T cells are involved in the pathogenesis of an Omenn syndrome murine model. J Clin Invest. 2007 May. 117(5):1270-81. [Medline]. Henderson LA, Frugoni F, Hopkins G, Al-Herz W, Weinacht K, Comeau AM, et al. First reported case of Omenn syndrome in a patient with reticular dysgenesis. J Allergy Clin Immunol. 2013 Apr. 131(4):1227-30, 1230.e1-3. [Medline]. Nanda A, Al-Herz W, Al-Sabah H, Al-Ajmi H. Noninfectious cutaneous granulomas in primary immunodeficiency disorders: report from a national registry. Am J Dermatopathol. 2014 Oct. 36(10):832-7. [Medline]. Harp J, Coggshall K, Ruben BS, Ramírez-Valle F, He SY, Berger TG. Cutaneous granulomas in the setting of primary immunodeficiency: a report of four cases and review of the literature. Int J Dermatol. 2015 Jun. 54 (6):617-25. [Medline]. Tagliaferri L, Kunz JB, Happich M, Esposito S, Bruckner T, Hübschmann D, et al. Newborn screening for severe combined immunodeficiency using a novel and simplified method to measure T-cell excision circles (TREC). Clin Immunol. 2017 Feb. 175:51-55. [Medline]. Zafar R, Ver Heul A, Beigelman A, Bednarski JJ, Bayliss SJ, Dehner LP, et al. Omenn Syndrome Presenting with Striking Erythroderma and Extreme Lymphocytosis in a Newborn. Pediatr Dermatol. 2017 Jan. 34 (1):e37-e39. [Medline]. Capo V, Castiello MC, Fontana E, Penna S, Bosticardo M, Draghici E, et al. Efficacy of lentivirus-mediated gene therapy in an Omenn syndrome recombination-activating gene 2 mouse model is not hindered by inflammation and immune dysregulation. J Allergy Clin Immunol. 2017 Dec 11. [Medline]. Wat M, Olicker A, Meyerson H, Nedorost S, Paller AS, Cooper K. Topical Hypochlorite and Skin Acidification Improves Erythroderma of Omenn Syndrome. Pediatrics. 2018 Apr. 141 (Suppl 5):S408-S411. [Medline]. Caglayan Sozmen S, Isik S, Arikan Ayyildiz Z, Yildiz K, Cakır Y, Ozer E, et al. Cyclosporin treatment improves skin findings in omenn syndrome. Pediatr Dermatol. 2015 Mar-Apr. 32 (2):e54-7. [Medline]. Gozdzik J, Czogala W, Skoczen S, et al. Rapid full engraftment and successful immune reconstitution after allogeneic hematopoietic stem cell transplantation with reduced intensity conditioning in Omenn syndrome. Pediatr Transplant. 2008 Oct 25. [Medline]. Schonberger S, Ott H, Gudowius S, et al. Saving the red baby: Successful allogeneic cord blood transplantation in Omenn syndrome. Clin Immunol. 2008 Dec 7. [Medline]. Garcia-Lloret M, McGhee S, Chatila TA. Immunoglobulin replacement therapy in children. Immunol Allergy Clin North Am. 2008 Nov. 28(4):833-49. [Medline]. [Full Text]. Siegel J. The product: All intravenous immunoglobulins are not equivalent. Pharmacotherapy. 2005 Nov. 25(11 Pt 2):78S-84S. [Medline]. Pai SY, Logan BR, Griffith LM, Buckley RH, Parrott RE, Dvorak CC, et al. Transplantation outcomes for severe combined immunodeficiency, 2000-2009. N Engl J Med. 2014 Jul 31. 371(5):434-46. [Medline]. [Full Text]. Brown L, Xu-Bayford J, Allwood Z, et al. Neonatal diagnosis of severe combined immunodeficiency leads to significantly improved survival outcome: the case for newborn screening. Blood. 2011 Mar 17. 117(11):3243-6. [Medline]. Van der Ploeg CPB, Blom M, Bredius RGM, van der Burg M, Schielen PCJI, Verkerk PH, et al. Cost-effectiveness of newborn screening for severe combined immunodeficiency. Eur J Pediatr. 2019 Feb 25. [Medline]. Aleman K, Noordzij JG, de Groot R, et al. Reviewing Omenn syndrome. Eur J Pediatr. 2001 Dec. 160(12):718-25. [Medline]. Brooks EG, Filipovich AH, Padgett JW, Mamlock R, Goldblum RM. T-cell receptor analysis in Omenn's syndrome: evidence for defects in gene rearrangement and assembly. Blood. 1999 Jan 1. 93(1):242-50. [Medline]. Brugnoni D, Airo P, Facchetti F, et al. In vitro cell death of activated lymphocytes in Omenn's syndrome. Eur J Immunol. 1997 Nov. 27(11):2765-73. [Medline]. Chan A, Scalchunes C, Boyle M, Puck JM. Early vs. delayed diagnosis of severe combined immunodeficiency: a family perspective survey. Clin Immunol. 2011 Jan. 138(1):3-8. [Medline]. [Full Text]. Chilosi M, Facchetti F, Notarangelo LD, et al. CD30 cell expression and abnormal soluble CD30 serum accumulation in Omenn's syndrome: evidence for a T helper 2-mediated condition. Eur J Immunol. 1996 Feb. 26(2):329-34. [Medline]. Lacy CF, Armstrong LL, Goldman MP, Lance LL (Editors). Drug Information Handbook 2008-2009. 16th edition. Cleveland, Ohio: Lexi-Comp, Inc; 2008. Ege M, Ma Y, Manfras B, et al. Omenn syndrome due to ARTEMIS mutations. Blood. 2005 Jun 1. 105(11):4179-86. [Medline]. [Full Text]. Gennery AR, Hodges E, Williams AP, et al. Omenn's syndrome occurring in patients without mutations in recombination activating genes. Clin Immunol. 2005 Sep. 116(3):246-56. [Medline]. Giliani S, Bonfim C, de Saint Basile G, et al. Omenn syndrome in an infant with IL7RA gene mutation. J Pediatr. 2006 Feb. 148(2):272-4. [Medline]. Gomez L, Le Deist F, Blanche S, et al. Treatment of Omenn syndrome by bone marrow transplantation. J Pediatr. 1995 Jul. 127(1):76-81. [Medline]. Gruber TA, Shah AJ, Hernandez M, et al. Clinical and genetic heterogeneity in Omenn syndrome and severe combined immune deficiency. Pediatr Transplant. 2008 Sep 15. [Medline]. Grunebaum E, Bates A, Roifman CM. Omenn syndrome is associated with mutations in DNA ligase IV. J Allergy Clin Immunol. 2008 Dec. 122(6):1219-20. [Medline]. Mazzolari E, Moshous D, Forino C, et al. Hematopoietic stem cell transplantation in Omenn syndrome: a single-center experience. Bone Marrow Transplant. 2005 Jul. 36(2):107-14. [Medline]. Omenn GS. Familial reticuloendotheliosis with eosinophilia. N Engl J Med. 1965 Aug 19. 273:427-32. [Medline]. Rieux-Laucat F, Bahadoran P, Brousse N, et al. Highly restricted human T cell repertoire in peripheral blood and tissue-infiltrating lymphocytes in Omenn's syndrome. J Clin Invest. 1998 Jul 15. 102(2):312-21. [Medline]. [Full Text]. Santagata S, Villa A, Sobacchi C, et al. The genetic and biochemical basis of Omenn syndrome. Immunol Rev. 2000 Dec. 178:64-74. [Medline]. Schwartz SA. Intravenous immunoglobulin treatment of immunodeficiency disorders. Pediatr Clin North Am. 2000 Dec. 47(6):1355-69. [Medline]. Signorini S, Imberti L, Pirovano S, et al. Intrathymic restriction and peripheral expansion of the T-cell repertoire in Omenn syndrome. Blood. 1999 Nov 15. 94(10):3468-78. [Medline]. [Full Text]. Thampakkul S, Ballow M. Replacement intravenous immune serum globulin therapy in patients with antibody immune deficiency. Immunol Allergy Clin North Am. 2001. 21(1):165. [Full Text]. Tomizawa D, Aoki Y, Nagasawa M, et al. Novel adopted immunotherapy for mixed chimerism after unrelated cord blood transplantation in Omenn syndrome. Eur J Haematol. 2005 Nov. 75(5):441-4. [Medline]. Villa A, Santagata S, Bozzi F, et al. Partial V(D)J recombination activity leads to Omenn syndrome. Cell. 1998 May 29. 93(5):885-96. [Medline]. The authors and editors of Medscape Reference gratefully acknowledge the contributions of previous author Ann O'Neill Shigeoka, MD to the development and writing of this article.